Welcome! 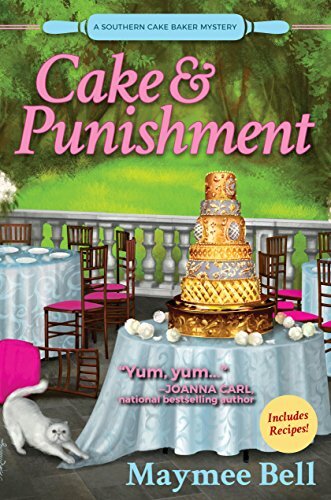 Today’s blog tour post is for Cake & Punishment, a Southern Cake Baker mystery by Maymee Bell. Today I have a guest post from Ms. Bell for you! The information about the book including purchase links will be listed after the guest post. When people find out I’m a writer and ask me what genre. I respond with cozy mystery. You can probably guess the next question. Cozy? What is a cozy? Trust me, I’ve been around long enough (40 novels) to know that cozy mystery genre doesn’t get the same hats off, Baptist nod, and thumbs up that thriller mystery or even just mystery writers get. And if it’s not bad enough, I have to tell them that I write cozy mystery. That really gets the quizzical looks that make me feels as if I have two heads. Cozy mystery is kinda just that. Cozy. More along the lines of Murder She Wrote where the sleuth of my novels has a job that is in a craft or a special talent. She stumbles on a murder that is somehow tied to her life and she has to solve the murder/crime on her own. There is no blood, guts, or gore and cozies are centered on the sleuth’s craft or gift. In my case with CAKE AND PUNISHMENT, Sophia Cummings, the sleuth, is a pastry chef who lives in New York City working at her dream job with her dream boat chef boyfriend. After she catches her boyfriend doing more cooking with the hostess of the restaurant, Sophia runs back to her small, southern, Kentucky hometown where she is going to gather her thoughts for a couple of weeks. It just so happens that her high school best friend is getting married and the cake baker quit. Sophia agrees to bake the cake but when the head chef of the reception is found dead. . .Sophia’s friend is number one suspect. Sophia knows there’s more way to skin a cat and her friend didn’t kill him over an argument about what are hors d’oeuvres being served at the wedding. But can Sophia solve the murder in time to not only let the wedding go off without a hitch, but back to her life in the city. But most cozies have relatable characters set in small towns with a cozy setting. Even though romance takes a back seat in the mystery, there is still a love interest to sweet the pot. By the time I’ve given my spiel, the person who asked me about what a cozy was, is spouting off movies or television shows that fit the cozy mystery genre. What do you love about cozy mysteries? Thanks for joining me today! If you wish to visit other stops on the tour, please click the banner below! I like that they are usually shorter, no blood, guts or gore, great small-town settings and characters that I really get to know. What do I like about cozy mysteries? The fact that they are indeed “cozy” – great for curling up with in a comfy chair, a blanket, a nice glass of wine . . . and being transported to another quaint place and realm.